Fiddle and Drum and Then Some! Driving and precise, the fiddle music of the Northern Appalachian Mountains has strong roots in the Celtic music of the Scots and the Irish. The ornamentation is specific and traditional. The music was made for the country dances of the northern climes. Originally from upstate New York and now a longtime resident of Pennsylvania, fiddler, Beverley Conrad, celebrates her northern roots with the music of the Lowlander Highlanders. Adding the rhythm of the Bodrhan drum and other percussion instruments, Luke Glick, completes the sound of the northern beat. Beverley and Luke, perform a variety of historical music from the northern Appalachian mountains. 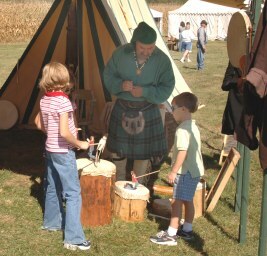 Many of the old time tunes that are now a part of the culture of the region were brought here by the Scots and the Irish as they settled the area. They are the dance tunes, the songs played by the fiddler at contra dances and square dances. Whether it be a jig, a reel, a waltz, or a polka the music is spirited and is meant for dancing and toe tapping. Performing on fiddle for over forty years, Beverley specializes in preserving these old tunes many of which were taught her by the old-timers, the fiddlers from this region who are now leaving us but leaving their music behind to be picked up and carried on. Luke accompanies Beverley on Bodrhan, djembe, handmade log drums, bones, jaw harp, spoons, fiddlesticks, tin whistle and octave fiddle. 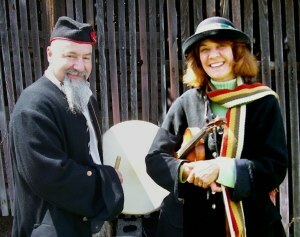 Beverley and Luke have over 600 tunes at their fingertips spanning three centuries and different eras—French Indian War, Colonial, Civil War and Victorian. Celtic tunes from Scotland and Ireland such as Hills of Glenorchy, Whiskey Before Breakfast, Shebeg Shemore, Loch Lomond and Rosin the Beau are a part of their old world repertoire. Old time tunes born on this side of the pond such as Oh, Susanna, Turkey in the Straw, Redwing, Soldier’s Joy and Liberty are a part of their Americana repertoire. As keepers of the music, they share historical facts, stories, legends and tidbits of information about the tunes they play. Beverley and Luke enjoy dressing for the occasion and outfit themselves according to event, era and the weather! Fiddle, Bodhran and a homemade log drum. Learn all about the Fiddle at Bev's official Fiddlerwoman website. Fiddle tabs, legends, lore and helpful tips on how to play the fiddle. Questions answered through email and snail mail.